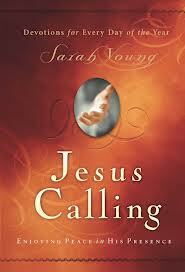 Over the course of the last few years, we have had numerous inquiries about the book, Jesus Calling, written by the Presbyterian wife of a missionary to Japan named Sarah Young. The following article provides links to our research on this subject. As this blog explains, Jesus Calling is essentially a devotional book containing one year’s worth of short reflections on the Christian faith which Young claims came from Jesus Christ in a way similar to messages He allegedly gave to two anonymous “listeners” who authored the book, God Calling.The problem is that these two listeners were engaged in what is known as automatic writing – an occult art – while receiving these messages – a fact that is the main source of controversy surrounding Jesus Calling. For those of you who are not familiar with automatic writing, this practice is similar to the Ouija board only instead of spelling out answers to questions with a planchette, a person “receives” these answers on paper. They hold a pen which is said to move independently across the page and write out messages, usually from so-called deceased persons or from unknown discarnate entities. You can find more information about this practice here. Young was enchanted by the listener’s work and, according to the foreword which used to appear in Jesus Calling, said she began to wish for the same abilities. While there’s nothing wrong with journaling – millions of us do it – to publish these writings as coming from Christ Himself is another point that upsets many, especially Catholics who are used to relying upon the Church’s proven methods of discernment before making such a pronouncement. Others complain that while there is nothing wrong with the doctrine in Young’s messages, they are concerned about the way she infers that while the Bible is inerrant and infallible, it is not sufficient – at least not for her. In spite of these problems, the book has become a bestseller – something the publisher (Thomas Nelson) wants to see continue. For this reason, they decided to simply remove all references to God Calling from the book’s introduction. Instead, they are now insisting that these aren’t messages from God but are simply Young’s own thoughts and inspirations. This is just “Sarah’s prayer journal”, they insist, and she’s not really speaking for Jesus. The links provided in this blog, if followed, will give the inquirer a comprehensive view of the controversy surrounding Jesus Calling. It will then be up to them and God to decide if the book should be read. Meanwhile, we highly recommend Francisco Fernandez’s In Conversation with God which provides short daily readings that contain not only commentary on Scripture but also reflections on the Catechism and from some of the Church’s greatest saints. There are 7 volumes to this devotion which can be purchased separately or as a set. Divine Intimacy is another daily devotional book that contains meditations on the interior life for every day of the year. Grace Filled Moments offers daily meditations based on Scripture and the writings of the saints. Posted in New Age, Occult	| Tagged What's wrong with Jesus Calling?